Lindsey Duff consistently goes above and beyond the call of duty. She often volunteers on missions during her off-time, some of which take Lindsey away from home for days or weeks at a time. One of these volunteer missions was a very complex bariatric transport to the Middle East. No other company had the resources to complete this mission. Lindsey was responsible not just for patient care, but also for the wellbeing of another medical crew member who became seriously ill during the lengthy transport. 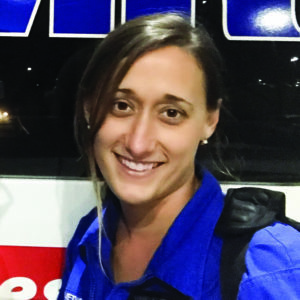 During AMR Air Ambulance’s more than four-month FEMA deployment to the U.S. Virgin Islands for Hurricane Irma and Maria relief, Lindsey spent six weeks on duty with just two breaks, each lasting less than a week. Lindsey voluntarily sacrificed her personal time as well as the holiday season to support the Virgin Islands community. Lindsey is truly a selfless and loyal Flight Nurse who facilitated challenging patient evacuations while living in sub-optimal conditions in a post-disaster zone. Lindsey received positive recognition from other Air Medical programs for her energetic and “can do” attitude, and represented our organization with honor. AMR Air Ambulance is extremely proud to have Lindsey represent our organization as a 2018 Star of Life!